EdibleCreativity: let's review: mediterranean tavern, pooler, ga. I had errands to run Saturday morning... stepping out early to beat impending thunderstorms. My husband, who accompanied me works in Pooler, Georgia and is always on the lookout for new dining opportunities. By lunchtime, we were done piddling around town and our breakfast was a distant memory. A few years ago, Pooler, (a northwest suburb of Savannah right off of I-95) was touted as the fastest-growing town in the state. I don't know if it still has that distinction, but it feels like the gospel truth. Every time I drive 15 minutes north, I find all kinds of excitement going on. And, hey, their town slogan is, It's cooler in Pooler. Ha. Today, our new-found gem is Mediterranean Tavern. We stopped in for lunch and left feeling very satisfied. Owner and talented pastry chef, Helen Goniotakis has only been in business since March, 2013. In addition to the creative Mediterranean menu, a pastry case filled with homemade sweets sits front and center in the dining room. It beckoned us to as we dined... "Why don't you come a bit closer, shugah..."
We each ordered a Gyro with a small Greek salad on the side. The menu offers french fries or roasted and seasoned Greek potatoes with a gyro. As tempting as the Greek potatoes sounded, we chose the healthy option... in order to justify dessert, of course. Our side Greek salad was $2 extra, but well worth the up-charge. The salad arrived first. Half expecting a handful of mediocre lettuce tossed onto a styrofoam disc, we gawked in stunned silence at the display set before us. Side salad? Really? It was at that moment we concluded that there would be leftovers. Hooray for Sunday lunch! The gyro was generously portioned as well. 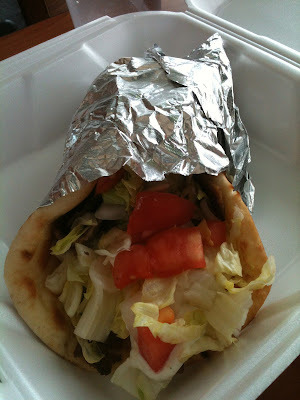 The meat, which was falling out of a warm, over-stuffed pita was very tender. The tzatziki sauce made me want to dive in and swim around... cool and refreshing on a warm summer day. It made a great dip for the warm pita triangles on my salad plate. Our sweet server, Lindsay, persuaded us to try the baklava... No arm-twisting necessary. We did have a salad, after all. The rolled baklava was nice and cinnamon-y. (Yes-huh, cinnamon-y is too a real word.) 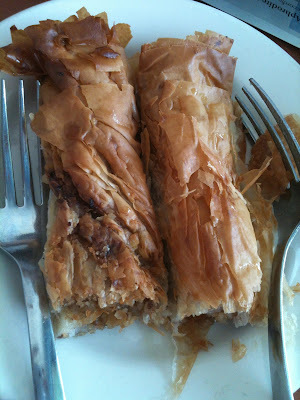 The flaky filo surrounded the nutty, sweet filling. When I bit into it, the soft crunch sound made me a bit giddy. Good baklava will do that to a person. While chatting with Helen, we learned that each second and fourth Saturday, the restaurant features a belly dancer during dinner. Plans for a monthly Greek night are slated for the future. Imported Greek musicians will be on hand to entertain diners. You need to check out this quaint eatery in Pooler... it's where the cool people are. Great write up. We will definitely try it. Awww, thanks Amber. You will love this place. Great food! Good portions! Quality taste! Quite refreshing! "Cool" vibes..good, quick service and stressfree transaction. Recommend it. Huge portions, in fact. I visited again recently and ordered leg of lamb special... had to take half home for next day. YAAAAYYY for leftovers. And the Greek coffee? to. die. for.